Change happens every day whether it is good or bad. People die, give birth, get jobs, lose jobs, graduate, get married, move, etc. Some of these moments are just simply change and some are life-changing. Today March 1st is the 13th anniversary of my car accident. My life-changing moment. On this day each year I pause to think about how far I’ve come and how many more days and experiences I have been blessed to be a part of. I don’t let it be a sad day and focus on all I lost. I think about the fact that I survived and am here today. It would be very easy for me to be sad or depressed; to think why me or about all the “what ifs”; to live life with anger and resentment. But then I think about what type of person I would be if I lived my life that way. It really would be so easy to succumb to the pain and confusion that comes every day, stay in bed and complain. Believe me, there are some days I do. But it doesn’t last for very long. I want to take advantage of the days I have. It’s been a long and challenging road so far. My life has taken twists and turns, leading me in various directions. Life with a brain injury is hard. Very hard. There have been many obstacles in my way that I’ve had to get over and daily challenges that I’ve had to adjust too. It took 13 years of slow and steady progress and various types of therapy to get me where I am now. Hyperbaric Oxygen treatments have been my most recent success. I never gave up and I never will. Throughout the last 13 years I learned that I’m here for a reason. (March 1st is also the beginning of TBI awareness month) I’m strong as a stubborn mule and can accomplish all kinds of new dreams and goals. The accident changed my life, it changed me, my personality, my physical well being, and put some pretty big limits on what I can accomplish and what I had planned to do in life. My doctors watched me blow through many of those limits. The accident was definitely not on my bucket list of things to experience before I die. Bucket list, smucket list. 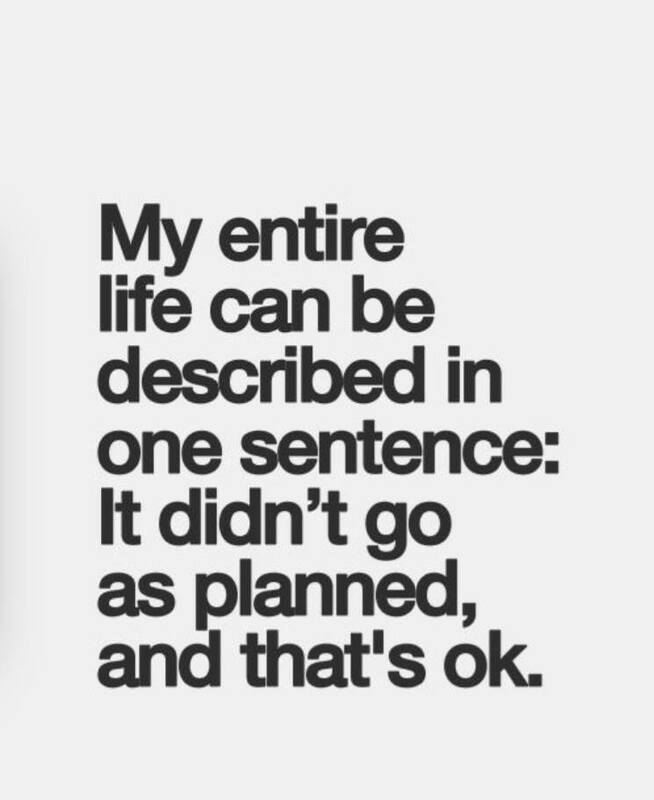 I learned you can make all the perfect plans you want but life will take you where you are meant to be in spite of you trying to take control. And that will be your real journey. The one you are meant to have. It will be your best plan, your best day ever, your best life ever. I love who I am now and what I am capable of. The me that my struggles have turned me into is pretty damn awesome. I still want to love and be loved. I still need friends and family to support me. I want to be an advocate for others with disabilities, Traumatic Brain Injury and PTSD, and the 300,000 others like me, others who have faced similar changes and challenges. It’s all new territory. Navigating it all with a TBI, fatigue and chronic pain is no easy task. It may be hard at times, but I’ve learned to put aside the pain and confusion and struggle and use that energy to help others. I pause every single day and am thankful for 13 years full of blessings, family, friends, grand-babies, sunsets, fishing, hiking, helping others. . . the list could go on. There is nothing like almost dying to wake you up and make you cherish every moment. Where I am today is not at all close to the plans I had 13 years ago. But it is the best place for me. And today is the best day ever. Just passing this one along. It’s like she is in my head. It’s exactly how I feel. And she expresses it so well. I wish there was more that I could do to help soldiers know about HBOT and encourage them to try it now. You know the saying “an ounce of prevention is worth a pound of cure”. The problem is the soldiers I talk with are minimizing their pain and “sucking it up” and when it all falls apart it will be so much more difficult to sort it out. They compare themselves to their buddies that died or lost limbs or have seizures and think “I am fine”, but it just isn’t the case. What you wrote about suicide tears me up. I know of soldiers that couldn’t take it and killed themselves during their deployment. We at Soldiers’ Angels try to prevent them from feeling isolated or abandoned by sending letters and packages, but what if it is a brain injury? We need to get this word out to the chaplains too. I know that chaplains are bound and cannot reveal if a soldier has told him that he is contemplating suicide. Your email makes me want to get the word out to these chaplains to have these soldiers tested for brain injury. Of course the difficulty there is that as with some of my military son’s friends the MRI’s don’t show any damage. Their symptoms of headaches and memory problems and anger and impulse control again are minimized due to stress from long deployments. Even if they are sent to bases for Imaging the results are inconclusive. In fact the soldier who lives near me was in a tank that rolled over an IED and would you believe that even tho he had been knocked unconscious he was only treated at a small Combat Outpost by a medic and went right back to work. It was only 6 weeks later when his speech began to slur, when the aspirin couldn’ contain his pain, that they sent him to Balad and then forward to his present rounds at the VA. He constantly minimizes the seriousness of his injury and what it means for his future. One can’t help but wonder about the brain injuries these soldiers may have had that later committed suicide. Of course the military hushes these incidences up so as to keep morale high. Soldiers are led to believe that these guys were somehow inadequate…basically they try not to think about it at all..and that is what the military encourages..just get in there and do your job….you can’t change what has happened. But I do appreciate your point that we need to know what is happening to them and how their brains are affected and those consequences. How can they get treatment when their injuries are hardly acknowledged. This has always been the problem with TBI. It is the invisible injury. Now tho the sheer number of our military with this reality is as frightening to me as the budget crisis. H.R. 146 is a bill in the house that supports Hyperbaric Oxygen Therapy for our military. The societal need is great. It is vital that we support bills like this for the health of our Veterans, Military personnel and US citizens. 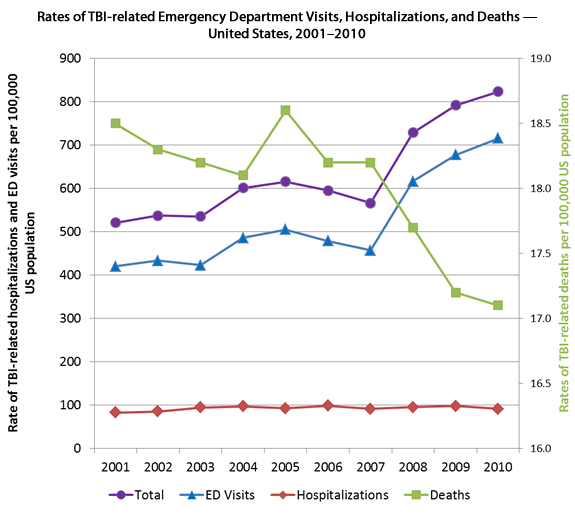 Transportation accidents, by a small margin, was the leading cause of military deaths in 2008, slightly more than combat. The fighting in Iraq and Afghanistan accounted for anywhere from one out of three deaths in the military — in 2005 and 2010 — to more than 46 percent of deaths in 2007, during the height of the Iraq surge, according to the chart. Does it seem if the world is going crazy? I wonder if any of you hear what I do when I read these articles. There is no crazy about it. Our current military action is causing a multitude of problems here at home for our Veterans. In these articles I hear desperate cries for help. They are slipping through the cracks and not receiving beneficial treatment through the VA for several reasons. Things need to change. I want them to know that I hear them. I want you to hear them. I believe with all my heart that the gunman in this story was desperate for help and answers. This “craziness” will not stop until we find them all and get them treated for their war injuries, the ones you can’t see, the PTSD and TBI. If you know a veteran or civilian with a story please listen. Ask them to write it down and send it to me. I’ll make sure they are heard. Since I’ve began advocating for HBOT for Traumatic Brain Injury I have met so many heroes, so many desperate for relief. Their stories keep me up at night. I toss and turn wondering how to find them all and make the VA help them. But I do hear good stories and happy endings like Captain Smothermon. His story is below and is one that gives you hope. I meet people like this almost everyday. I hear their stories and I want to share them. Listen and you might hear what we need to do to help so that others can get relief. Help me find their stories so they can be heard. In the immediate aftermath, I could barely concentrate enough to read a piece of paper, could hardly sleep through the night. It was terrible. The best way I can describe the experience is that one day, I woke up but my brain didn’t. From then on nothing felt quite right. And while there was a natural recovery period for my TBI as my brain adapted to its newfound roadblocks and failures, the recovery process eventually plateaued. I would have spurts of normality punctuated by severe lapses in cognition. This became my new normal: everything I would do required at least twice as much mental exertion in order to deliver results which were, at best, less than what I had once been capable of; my ability to multi-task was almost completely gone; my train of thought would be consistently lost mid-sentence; I was perpetually exhausted, yet unable to sleep; I was mentally broken and emotionally numb. You have all read about my struggles with my Traumatic Brain Injury and followed me in my path of recovery. Some of you know that this year has been incredible for me. I received 80 Hyperbaric Oxygen Treatments that changed my life. It has been the icing on the cake of my recovery by relieving my Post Traumatic Stress Disorder and greatly improving my life by relieving many of the symptoms I suffered with from my TBI. My friends and family are shocked with the changes they have seen. I’m not the person I was before the accident, I’m better. Much better. Recently my Neuropsychologist approved me to begin to search for gainful employment up to 6 hours per week! I have scheduled further testing with her and I can’t wait to see the changes I have made since I was first tested 5 years ago. Life is good and so very different from even less than a year ago! It’s all over in the news. You don’t have to search very hard to see that HBOT needs to be available to those who need it. Today on Fox news Bill O’Riely announced his support with The Independence Fund. Oklahoma passed SB1604, an act requiring the state to pay for Veterans to receive HBOT to relieve their symptoms resulting from their TBI and or PTSD at no cost! And this past June, the House of Representatives unanimously passed H.R. 1098, the Traumatic Brain Injury Re-authorization Act (TBIRA), legislation to reauthorize programs that will provide resources for those with traumatic brain injury while also affording an investment in education and research around traumatic brain injury prevention. These are the winds of change. After spending 11 months around others undergoing hyperbaric treatment I personally discovered the desperate need of those around me who are also suffering with TBI and PTSD to be able to get relief. I watched as myself and others were healed and lives were changed. HBOT works. It is only a matter of time before others will be able to receive this treatment. And you can help it happen. Currently, I am part of an incredible team that is hoping to get legislation started for HBOT in the state of Idaho in time for the January legislative session. I’m asking you to write a letter of support to your local representatives. You can find their info here. We are trying to get their attention and currently looking for a legislator to sponsor a bill. You can read my letter of support also. Help me spread the word. Today, on Veteran’s Day as you thank a Veteran for their service, lets also give them and others with TBI and PTSD hope for a better future. I had the worst day ever. The study through the NBIRR I’ve been participating in for relief of my TBI and PTSD symptoms has been shut down. I was driving back home from the local coffee hut when I found out. I had called the center to make some more appointments for hyperbaric oxygen treatments and was told the study was shut down and they weren’t seeing patients right now. I would receive a call if and when the study started up again. I was in shock. I could barely say goodbye. Numb with disbelief I hung up the phone and began to cry. I was devastated. Hyperbaric Oxygen treatments have changed my life in a really big way. My PTSD is practically gone. I can understand conversations better than I have for 12 years. My mental fatigue is so much better and I have fewer headaches. My quality of life is so much better now compared to even just 6 months ago. 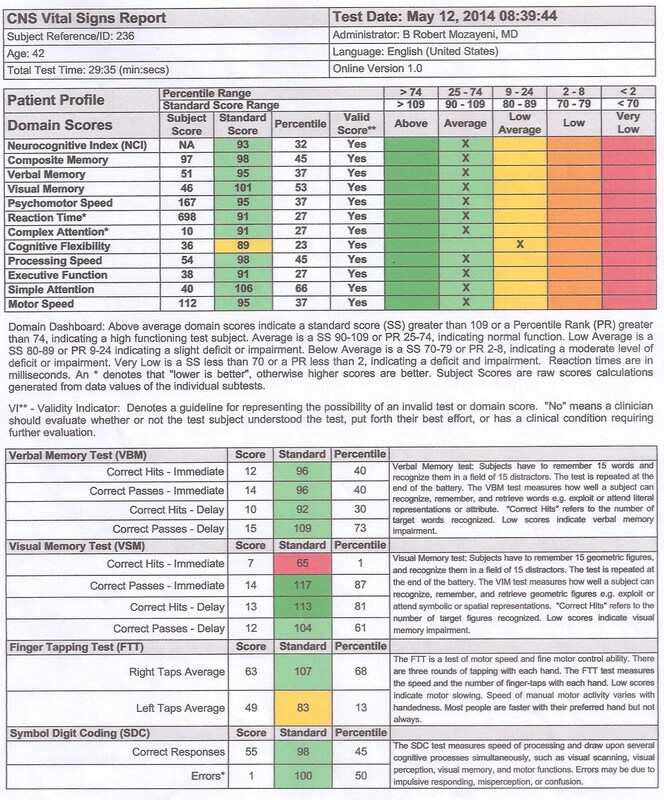 You can see my test results and benefits here. And now its over. All gone. I’m incredibly thankful for the healing I’ve received but I really wanted to see just how much better I would get, how much different I could feel. This was just not my favorite day. I am not sure how or why the NBIRR decided to stop the study. I’m incredibly thankful that I was one of the lucky ones able to get into the study. But what frustrates me the most is the staggering amount of veterans and civilians that receive a TBI every year. The treatment they are getting now with common medications is not working and most likely their symptoms are getting worse. If Hyperbaric Oxygen treatments are working to relieve and possibly eliminate symptoms caused by TBI and PTSD then why isn’t it prescribed more for treatment and made more readily available to survivors? And my favorite question is why can’t it be billed and paid through our insurance companies? I have experienced relief first hand and I have seen the positive changes in the other people I received treatments with. I hear stories of how it changed someone’s life every time I go for treatment. I can see it in their faces and I hear it in their voices when they share their stories with me. As I think of the other study participants receiving the news of the study being shut down my heart is sick. The relief we have been getting is gone, taken away by the powers that be at the NBIRR or beyond. Just out of reach. I finally quit crying and turned my car around to head home. Trying to tell myself to be thankful for the treatments I did get and trying not to focus on what the rest of them might have brought me. I wasn’t sure how I was going to get through this day. I pulled into my garage, parked my car and grabbed my coffee cup to head inside. But stuck to my coffee cup was my punch card. You know the kind, buy 10 get one coffee free. I reached to grab it and it fell to the floor upside down. When I bent down to pick it up this is what I saw. I knew then that everything was going to be ok. I wasn’t sure how or when. But I knew I could rest assured that soon things will be better and HBOT will be available for those of us that need it so desperately. It will all work out eventually. I took a deep breath and considered all the work it will take. It seemed to me a huge endeavor to change laws and make it possible to bill insurance for treatment and to educate people about the healing benefits of HBOT. But I know that there are others out there with voices for those of us that need help. Voices to stand up for us and our needs and make things right. Faith is a verb. You can’t have faith without action. HBOT will eventually be a common treatment for TBI and PTSD. But I’m not going to sit back and wait for it to happen. I’m going to get up and help get it done. I have recently been called back for treatments. The study is still closed but Idaho Hyperbarics will still treat those of us that want it. Out of their own pocket. Because that is the integrity of the amazing people who work there. It kind of restores your faith in humanity doesn’t it? So I’m headed back to get the rest of my treatments. I won’t stay home, you couldn’t make me. I want to see just how much better I can be. Can you blame me? “I don’t think people understand how stressful it is to explain whats going on in your head when you don’t even understand it yourself.” Not sure who said it, but it was passed on to me by a good friend. It’s exactly how I’m feeling. I’ve tried to write this post over a million times. Only to bag it and try again. It’s so hard to explain to you everything that is happening in my head right now. But I’m going to try. Even though I just can’t find the words for how amazing and different I feel, I know the hyperbaric oxygen treatments are working. I’m enjoying every single day of the new me. The PTSD is almost gone completely. I’m not afraid any more. And I’m thinking so much clearer. I don’t need to “clock out” and take as many breaks either. I get to enjoy more of my days. And I have the results on paper to prove it all. 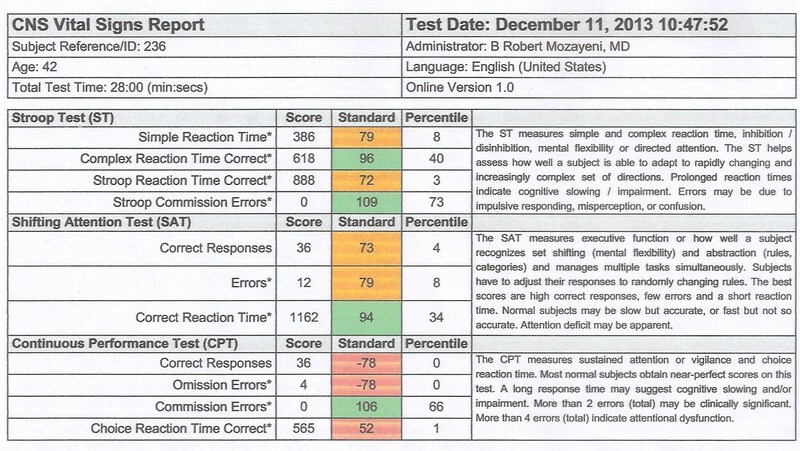 I can’t stop looking at my test results. I even slipped them into those nice little plastic sheet protectors to keep them safe as I carry them everywhere to show anybody who will look and listen. I showed all the staff at the HBOT clinic. I showed my physician. I showed the girls at the office where I get my allergy shots. I sent pictures to my kids. I’m showing all my friends and even some strangers. And then I look at them again. Everything I thought I was feeling is there on paper. Proof. Solid proof that I’m getting so much better. I’m still in shock a little bit over all the changes taking place. 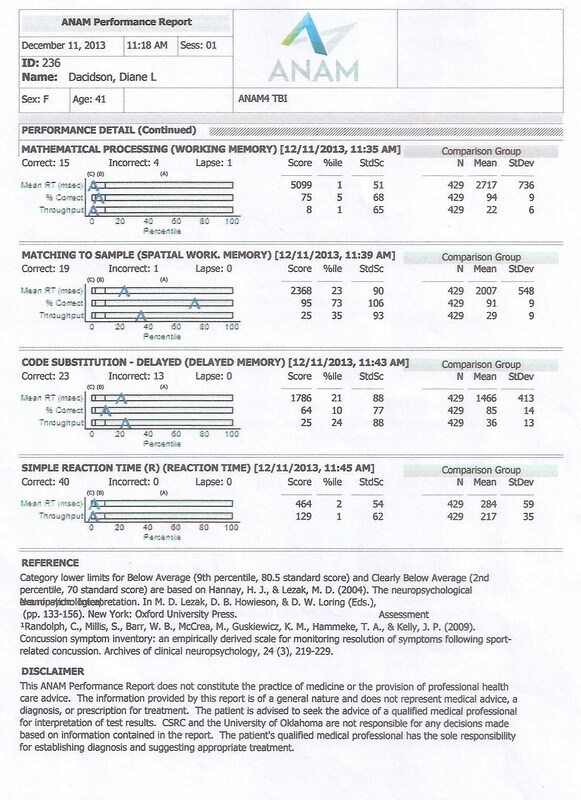 Below are the test results that were taken in December before I began HBOT. 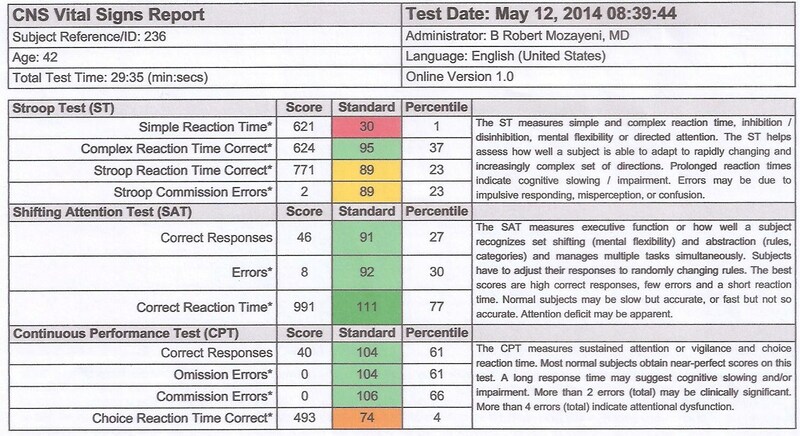 And right next to Decembers test results I have my most recent results from May. You can see for yourself why I keep showing them off. So, hopefully this will help you understand what I’m feeling right now. It’s wonderful.